Last night at CES AMD demonstrated working examples of its first SoC APUs codenamed “Temash” and “Kabini”. The company boasted that these system on chip designs will be “the industry’s first quad-core x86 SoCs”. Both of these APUs are scheduled to ship in H1 2013. In addition a new APU codenamed “Richland”, the successor to “Trinity” was presented at the show. It is currently shipping to manufacturers. Richland “delivers visual performance increases ranging from more than 20 percent to up to 40 percent over the previous generation of AMD A-Series APUs” according to AMD Performance Labs testing. 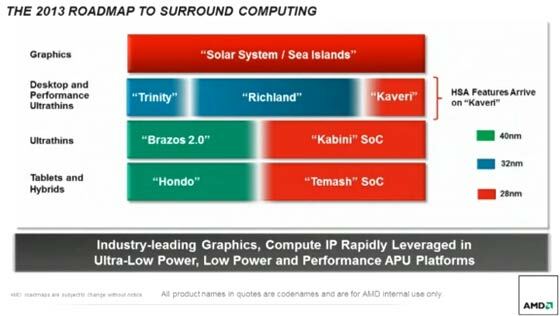 This trio of processor solutions are all aimed at different computing markets as you can see from AMD’s presentation slide. The 28nm Temash SoC will be targeted at tablets and hybrids, the 28nm Kabini SoC at Ultrathins and the Richland APU replaces Trinity on the desktop and in “performance ultrathins”. Temash, aimed at tablets and hybrids will be “the highest-performance SoC for tablets in the market, with 100 percent more graphics processing performance than its predecessor (codenamed “Hondo.”)” according to AMD. Kabini should facilitate ultrathin notebook designs with a great combination of performance and battery life. AMD claims Kabini can attain more than 50 per cent improvements in performance over its predecessor (codenamed “Brazos 2.0.”). Richland APUs are claimed to bring improvements to CPU, graphics and battery life compared to the Trinity range. 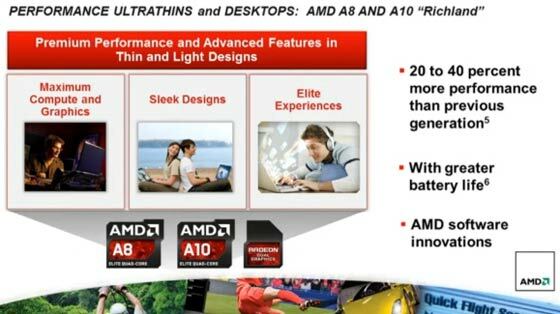 As well as the performance increases, AMD trumpets an “Elite software experience” that is bundled with Richland and Temash. The software pack includes utilities for gesture control, facial recognition, wireless connectivity and video streaming. Richland APUs are based on the same Piledriver cores as Trinity so it is unclear as yet where the 20 to 40 per cent performance gains will come from. Lisa Su, senior vice president and general manager, AMD Global Business Units said “With a groundbreaking new APU line-up in 2013, AMD is poised to win in high-growth consumer segments”. She added that “We are developing technologies with end users in mind – to bring true surround computing and immersive experiences to our everyday lives. It is exciting to bring our industry-leading APU technologies to market, including the industry’s first x86 quad-core SoC, while building on our leadership in graphics and gaming”. Richland sounds neat, pretty fast update to Trinity. TBH I think AMD could be onto a winner, if I were going for a full fat surface tablet my CPU of choice would be AMD for the graphics. Lets hope the manufacturers do not charge unnecessarily premium over Intel/other brand in forthcoming ultrathin book/tablet. Current range of APU notebooks are uncompetitive compare to Intel. I was waiting for APU for 8 months, after waiting for price to come down I ended up with better spec Ivy Bridge notebook on comparable price. One thing I noted, manufacturers tends to include louzy screen in APU notebook turning them into competing with those Pentium based al cheapo notebook.